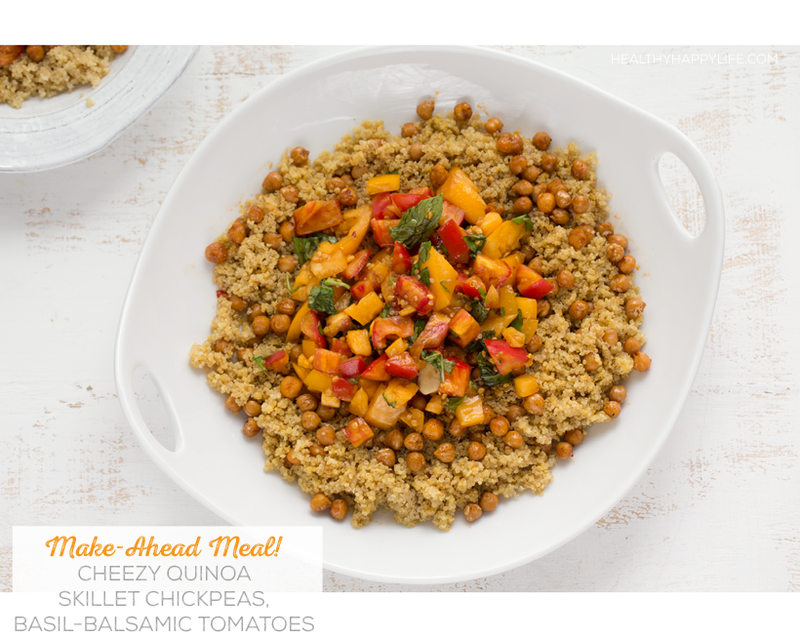 Cheezy Quinoa, Marinated Tomatoes, Skillet Chickpeas. Make-Ahead Meal. First, I whipped up some basic fluffy quinoa and added the best cheezy flavor ever, aka nutritional yeast. Then, I quickly started eating that quinoa via a big spoon. I paused. Got myself together. And kept cooking. Now, what do I add to this perfectly yummy pot of steamy, fluffy quinoa? Should I add some simple, cheezy, roasted broccoli and make this? 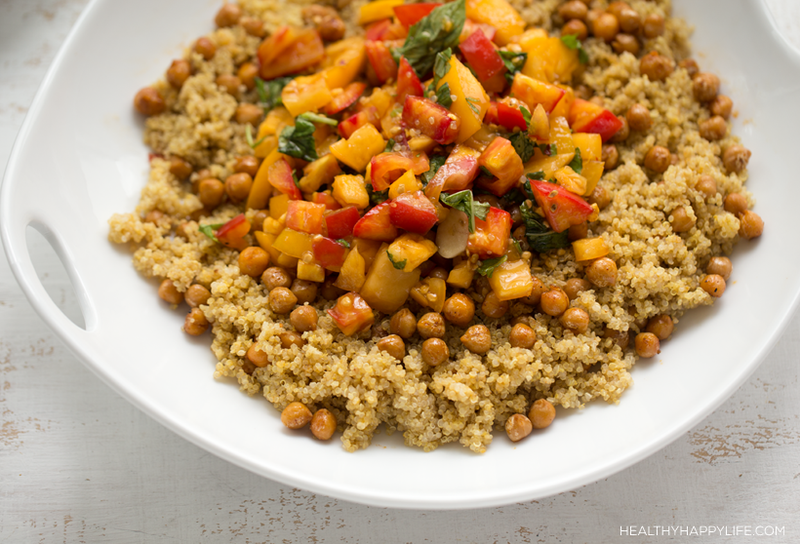 Whip up a friendly pineapple fried quinoa bowl? Should I turn out some amazing Curried (Cheezy) Quinoa Wraps? Simmer some mushroom and saffron-infused quinoa risotto? Today it was beautiful skillet chickpeas and some marinated heirloom tomatoes. I prepped this meal in advance and popped it in the fridge. When dinnertime rolled around I quickly sauteed some Field Roast spicy chipotle sausages to serve on top of this dish. Totally optional. 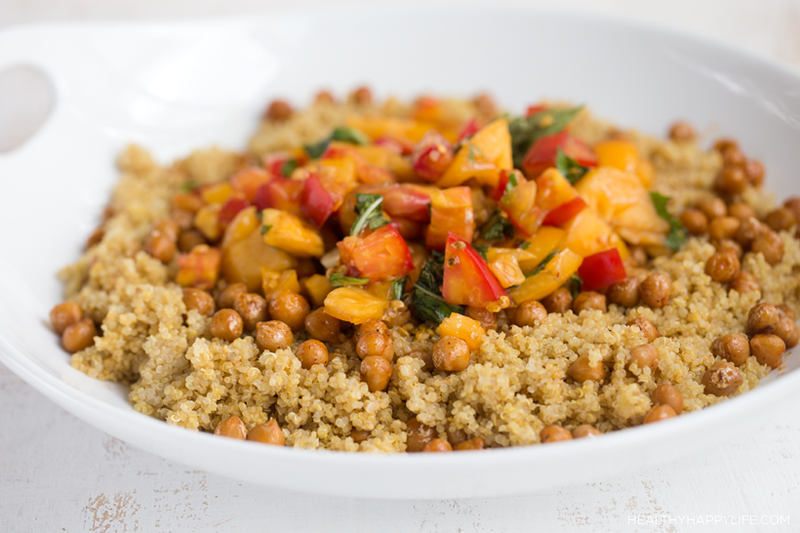 This was such an easy, satisfying and dee-licious, plant-based meal. I hope you grab a bag of quinoa at the store and give it a try! 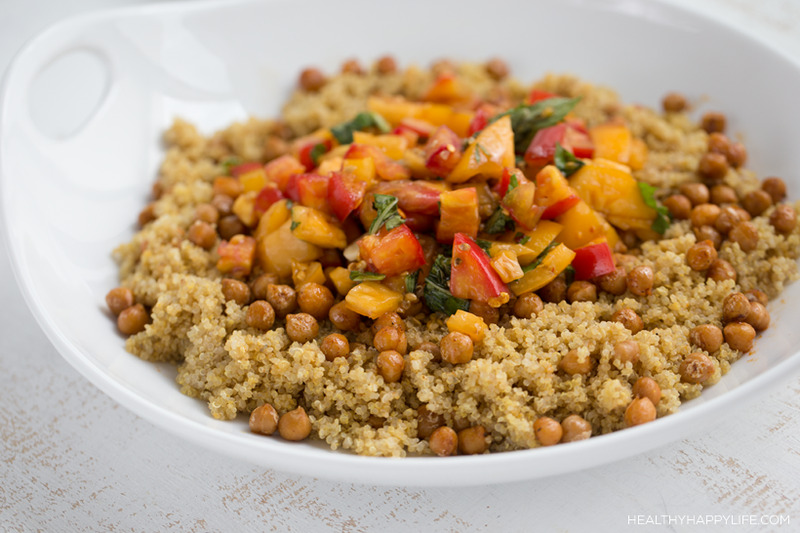 This make-ahead meal is packed with fiber, whole grains, plat-based protein and loads of flavor. You can serve it chilled or warmed. First start the fluffy quinoa. Bring the water to a boil, then add the quinoa and salt. Cover pot with lid and lower heat to a simmer. After 15 minutes, turn off heat, but do not lift lid. After 10-20 minutes, lift lid and fluff quinoa with a fork. Add in the nutritional yeast and fluff until combined. Set pot aside. Tomatoes: While the quinoa is cooking you can prep your tomatoes. Add all ingredients to a mixing bowl and toss to marinate the tomatoes. Set aside. 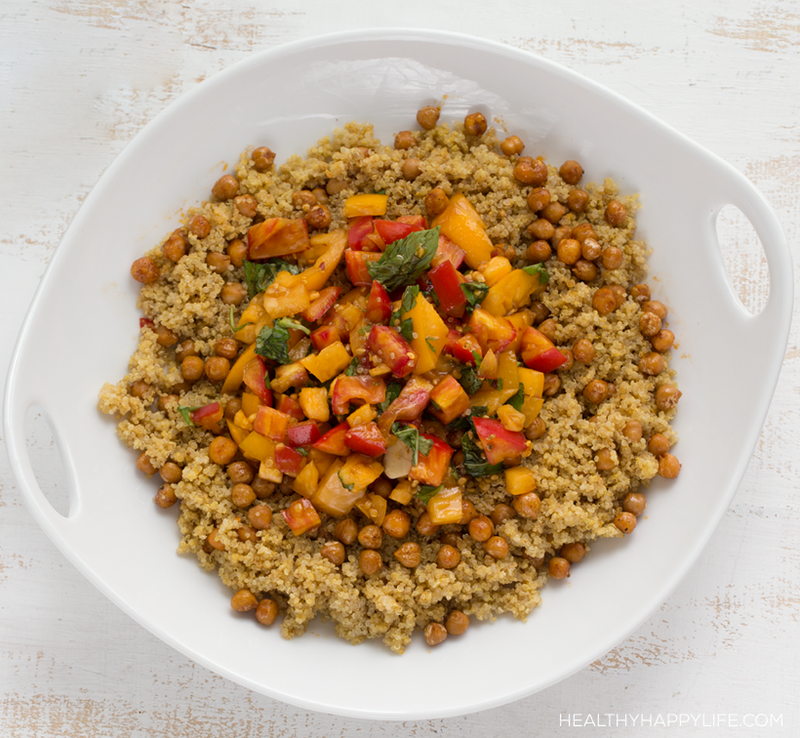 Chickpeas: Warm a skillet over high heat. Add the EVOO. 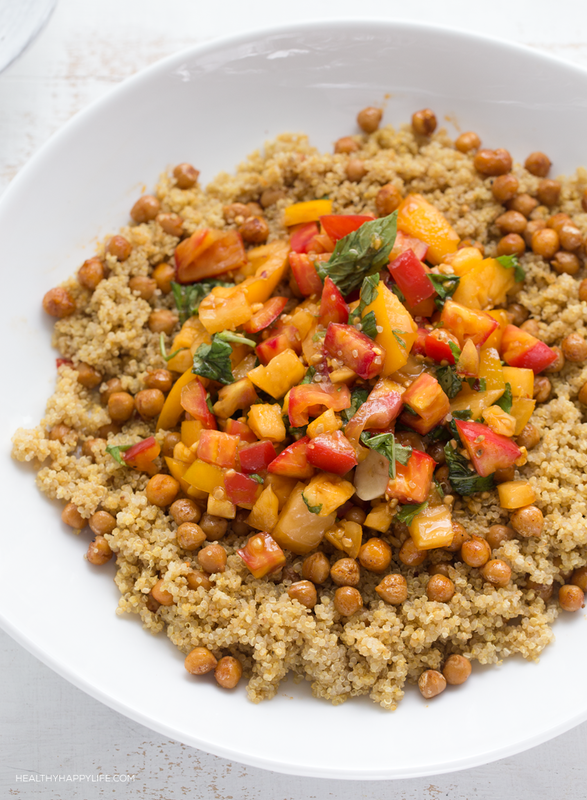 When EVOO is warm, add the chickpeas. Saute for 2-3 minutes until they start to sizzle and pop a bit. Then add in the pepper, paprika, salt and maple syrup. Shake pan a bit to distribute. Cook for a few more minutes until the side brown a bit. Turn off heat and set aside. 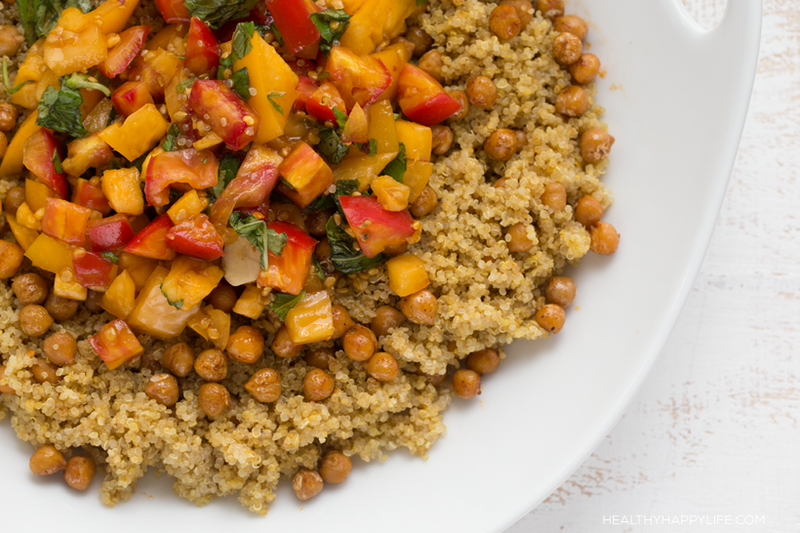 Putting it all together: Add a few heaping spoonfuls of the chickpeas to the quinoa and toss. Then pour quinoa into a serving platter or dish. Then top the quinoa with the remaining chickpeas. Then pour the tomatoes right on top, in the center of the dish. Serve like this. Optional: You can cover this entire plated meal and place the dish in the fridge to chill. You can then pull the dish from the fridge and serve it chilled. Or reheat in a skillet or in the oven. OR You can toss all the ingredients together and store the dish like that -- less fancy looking, more pre-made salad. Enjoy!